Do you have a little girl that is your little princess? Why not show your little miss what a pretty princess she is by throwing her a beautiful princess party! 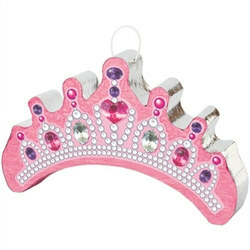 We have all of the pink accessories that make Princess parties so fun and unique. Princess Accessories are here to help your little lady get dolled up for her own royal ball. They also make wonderful party favors for her guests! 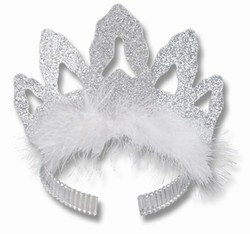 She will love her tiaras and party decorations from PartyCheap's Princess collection. With plenty of princess tiaras, stickers, and royal wands, she is sure to find something to add sparkle and shine to her favorite ball gown for a complete princess look! Browse through our options to find the perfect one for your little princess! Be sure to have some fun games as well! Fill the Pink Princess Castle Pinata with candy that the royal guests can then take home in their Princess Treasure Chests! Check out all of PartyCheap's Princess Party Supplies! Make sure your little girl looks like a princess at her party with a crown and wand. Get some of our fancy birthday hats for all her friends to wear. Take pictures of your princess and display the Butterfly Photo/Balloon Holder. Present your princess' guests with the Princess Treasure Chest and fill it with Silver Plastic Coins as a princess party favor or as a reward for winning the Kiss The Frog Party Game and don't forget the Tiara or our pink castle pinata! Make the table's decor complete with our princess tableware and princess centerpiece! The Princess Photo Prop also makes a great opportunity for getting pictures of the princess' guests so that she can remember this party forever! Princess parties are easy to decorate for with all of our great princess decorations, but what are you going to do with a house full of little girls to keep them entertained? Check out all of our princess accessories above for game ideas and activities. One of our most popular princess activities in the Kiss the Frog Game which is played like pin-the-tail on the donkey. Our other popular princess accessories include the Princess Activity Set, the Foam Wand Activity Kit, and the princess stickers which you can use to create you own activity. Finally give each little princess her own Princess Treasure Bag or a Pink Princess Canvas gift bag and fill it with fun treats like the Pink Party Beads for her to take home.